Sheffield United booked an FA Cup fourth-round tie at Bolton after beating QPR in an entertaining replay. The Blades took the lead early on when Lee Williamson cushioned a Nick Montgomery pass and drilled home. Substitute Jamie Ward then scored with his first touch before Richard Cresswell powerfully struck a third. Akos Buzsaky pulled one back from the spot after Derek Geary handled before Damion Stewart headed another late on, but United held on to move through. The result was a hardly a surprise given the two sides' contrasting recent fortunes but United will head back north mightily relieved after almost letting slip a three-goal lead in west London. The hosts came into the game having not reached the fourth round of the FA Cup since 2001 and while manager Paul Hart can take a lot of positives from the performance, another early exit will do little to ease the pressure he is already under. QPR's poor recent form did not stop them having the best of the opening stages, with Patrick Agyemang causing the Blades' defence problems. Jay Simpson glanced a header wide of Mark Bunn's post while Agyemang also saw an effort well blocked by Chris Morgan. But it was United who took the lead, despite a lack of creativity early on. A hopeful ball into the area from Montgomery was chested down superbly by Williamson and drilled past Radek Cerny. Simpson continued to look lively and could have levelled after a mistake from Stephen Quinn but put his shot wide, while Buzsaky really should have scored after bursting into the area - only to miss in the same manner. With half-time fast approaching Ched Evans wasted a glorious chance to extend the visitors' advantage. The young striker was sent clear by James Harper but with only Cerny to beat his crashing drive came back off the crossbar. Rangers responded immediately and had Geary to thank after his excellent goalline clearance denied Kaspars Gorkss. Hart's side were certainly worthy of an equaliser and continued to dominate after the break, with United not helping themselves by giving the ball away regularly. Blades boss Kevin Blackwell then opted to replace Williamson with Ward in a substitution that changed the game. The midfielder immediately raced onto a fine cross from Stephen Quinn and scored with his first touch - having only been on the field for 10 seconds. Ward then turned provider for Cresswell to make it 3-0 from close range and all but secure passage to the next round. But Rangers fought back valiantly. First, Buzsaky pulled one back from the penalty spot after Geary was harshly adjudged to have handled. Then Stewart got on the end of a Buzsaky free-kick to set up an exciting finish, albeit in front of just 5780 fans in west London. And the hosts came agonisingly close to forcing extra-time but Bunn pulled off a brilliant save to deny sub Antonio German in the dying seconds. "The way we started the second-half was a disaster. "We've gone 15 games without a clean sheet and you can see why. That is a side of our game that has to improve. "It was a very spirited comeback but it was too little, too late." "Good first touch, wasn't it? (on Jamie Ward's second-half goal). "We should have been two or three up by half-time so I'm glad we didn't have to rue those missed chances." 90:00+5:27 The final whistle goes and the game is over. Correction - 90:00+5:02 Corner taken by Wayne Routledge. 90:00+5:02 Outswinging corner taken from the left by-line by James Harper. 90:00+4:48 Antonio German takes a shot. Save by Mark Bunn. 90:00+3:51 Unfair challenge on Nick Montgomery by Patrick Agyemang results in a free kick. Marcel Seip takes the direct free kick. 90:00+2:15 Effort from the edge of the box by Antonio German goes wide of the left-hand post. 90:00+1:52 Darius Henderson concedes a free kick for a foul on Damion Stewart. Radek Cerny takes the free kick. 90:00+1:29 Ched Evans is ruled offside. Free kick taken by Radek Cerny. 89:34 The offside flag is raised against Darius Henderson. Free kick taken by Radek Cerny. 87:47 Assist on the goal came from Akos Buzsaky. 87:47 GOAL - Damion Stewart:QPR 2 - 3 Sheff Utd Damion Stewart scores a headed goal from close in. QPR 2-3 Sheff Utd. 87:21 Booking Booking for Stephen Quinn for unsporting behaviour. 86:45 Free kick awarded for a foul by Nick Montgomery on Antonio German. 79:58 Substitution Kyle Walker is brought on as a substitute for Derek Geary. 79:06 Substitution Antonio German on for Jay Simpson. 77:46 Corner taken right-footed by Wayne Routledge to the near post, James Harper manages to make a clearance. 75:33 Marcel Seip gives away a free kick for an unfair challenge on Patrick Agyemang. Direct free kick taken by Radek Cerny. 75:15 Damion Stewart fouled by Darius Henderson, the ref awards a free kick. Radek Cerny takes the free kick. 74:42 Nick Montgomery fouled by Mikele Leigertwood, the ref awards a free kick. Free kick taken by Mark Bunn. 73:19 Substitution Darius Henderson comes on in place of Richard Cresswell. 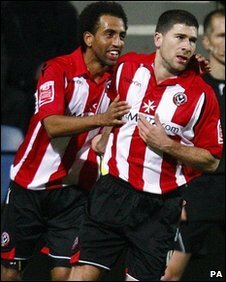 71:00 GOAL - Akos Buzsaky:QPR 1 - 3 Sheff Utd Penalty taken right-footed by Akos Buzsaky and scored. QPR 1-3 Sheff Utd. 70:16 Derek Geary is adjudged to have handled the ball. Correction - 69:31 GOAL - Richard Cresswell:QPR 0 - 3 Sheff Utd Richard Cresswell gets on the score sheet with a goal from inside the six-yard box low into the middle of the goal. QPR 0-3 Sheff Utd. 69:31 Assist by Jamie Ward. 69:31 GOAL - Ched Evans:QPR 0 - 3 Sheff Utd Ched Evans scores a goal from close range low into the middle of the goal. QPR 0-3 Sheff Utd. 68:08 Substitution (QPR) makes a substitution, with Adel Taarabt coming on for Alejandro Faurlin. 67:06 Assist on the goal came from Stephen Quinn. 67:06 GOAL - Jamie Ward:QPR 0 - 2 Sheff Utd Jamie Ward finds the back of the net with a goal from inside the area low into the middle of the goal. QPR 0-2 Sheff Utd. 66:13 Substitution (Sheff Utd) makes a substitution, with Jamie Ward coming on for Lee Williamson. 65:34 Free kick taken by Stephen Quinn. 65:34 Booking The referee shows Kaspars Gorkss a yellow card. 65:19 Ched Evans fouled by Kaspars Gorkss, the ref awards a free kick. 64:52 Derek Geary gives away a free kick for an unfair challenge on Akos Buzsaky. Akos Buzsaky takes the free kick. 63:06 Shot on goal by Alejandro Faurlin from just inside the area clears the crossbar. 59:37 Corner taken right-footed by James Harper from the right by-line, Close range headed effort by Richard Cresswell goes wide of the left-hand upright. 57:02 Damion Stewart restarts play with the free kick. 57:02 Booking Marcel Seip receives a caution for unsporting behaviour. 56:42 Unfair challenge on Jay Simpson by Marcel Seip results in a free kick. 55:40 Unfair challenge on Andy Taylor by Wayne Routledge results in a free kick. Andy Taylor restarts play with the free kick. 54:07 Nick Montgomery challenges Alejandro Faurlin unfairly and gives away a free kick. Strike on goal comes in from Akos Buzsaky from the free kick, Mark Bunn makes a save. 45:00+3:21 The half-time whistle blows. 44:38 Foul by Lee Williamson on Radek Cerny, free kick awarded. Radek Cerny restarts play with the free kick. 42:49 Nick Montgomery produces a right-footed shot from long range which goes wide right of the goal. 41:39 Kaspars Gorkss takes a shot. Chris Morgan makes a clearance. 41:10 Corner taken by Gary Borrowdale from the left by-line, Andy Taylor makes a clearance. 39:26 Ched Evans takes a shot. 38:52 Lee Williamson takes a shot. Kaspars Gorkss gets a block in. 31:41 Effort from the edge of the area by Akos Buzsaky goes wide of the left-hand post. 28:35 Foul by Kaspars Gorkss on Ched Evans, free kick awarded. James Harper takes the free kick. 27:50 Effort on goal by Jay Simpson from inside the box misses to the right of the target. 26:10 The assistant referee signals for offside against Richard Cresswell. Free kick taken by Radek Cerny. 24:11 Akos Buzsaky concedes a free kick for a foul on Derek Geary. Stephen Quinn takes the free kick. 23:20 Shot from just outside the box by Mikele Leigertwood misses to the right of the goal. 22:09 Unfair challenge on Gary Borrowdale by Richard Cresswell results in a free kick. Gary Borrowdale restarts play with the free kick. 20:43 The assistant referee signals for offside against Stephen Quinn. Radek Cerny restarts play with the free kick. 18:47 The assist for the goal came from Nick Montgomery. 18:47 GOAL - Lee Williamson:QPR 0 - 1 Sheff Utd A goal is scored by Lee Williamson from the edge of the penalty area to the bottom left corner of the goal. QPR 0-1 Sheff Utd. 16:55 Richard Cresswell fouled by Mikele Leigertwood, the ref awards a free kick. Free kick taken by Andy Taylor. 15:11 Short corner taken by Gary Borrowdale from the left by-line. 14:33 Jay Simpson has a headed effort at goal from deep inside the area missing to the left of the target. 13:02 Richard Cresswell concedes a free kick for a foul on Kaspars Gorkss. Radek Cerny restarts play with the free kick. 8:36 Damion Stewart restarts play with the free kick. 8:36 Booking The referee shows Ched Evans a yellow card for unsporting behaviour. 8:22 Foul by Ched Evans on Alejandro Faurlin, free kick awarded. 7:27 Alejandro Faurlin challenges Derek Geary unfairly and gives away a free kick. Free kick taken by Stephen Quinn. 6:50 Gary Borrowdale challenges Ched Evans unfairly and gives away a free kick. James Harper takes the free kick. 4:36 Foul by Mikele Leigertwood on Mark Bunn, free kick awarded. Direct free kick taken by Mark Bunn. 3:52 Alejandro Faurlin takes a shot. Save by Mark Bunn. Correction - 1:25 Effort from the edge of the penalty area by Mikele Leigertwood goes wide of the left-hand post. 1:25 Mikele Leigertwood has an effort at goal from just inside the box that misses to the right of the target. 0:11 Unfair challenge on Richard Cresswell by Kaspars Gorkss results in a free kick. The free kick is swung in left-footed by Stephen Quinn, clearance made by Kaspars Gorkss.